We’re spoiled for choice with the number of beaches up here thanks to the 144 islands that make up the Bay. As you drive your car, boat, caravan, jet ski or motorhome around this vast water-filled playground you won’t find it hard to find a pristine slice of paradise. Whatever your transport option you can of course just wing it, and you’ll be sure to stumble across a picture-perfect beach with limited foot traffic. If you have the luxury of a boat you’ll be able to stumble upon small coves and inlets with no one around aside from the soothing sound of birds. We recommend being nosy and exploring the wildlife in the area too. If you’re more of a planner and have a specific beach experience in mind, we’ve narrowed it down to our favourites, chosen for their natural beauty, ‘swimability’ and also accessibility. Ask the locals for their beach tips when you’re out and about as well – they’ll have some secret spots to share that are off the tourist trail. Paihia is the epicenter of the Bay of Islands so it’s a good place to start. It’s where most tourists base themselves and where loads of guided tours start from. There are loads of things to explore in the area, but there’s also a lovely beach right here under your nose. It’s an awesome place for a dip to cool off, but most appealing is that it’s the perfect launching spot for a water sports like kayaking, sailing or snorkeling. Everything can be easily hired or tours booked and launched from here. Just explore the wharf area for tour operators – otherwise, we have a bunch of options on this site of course. Main Beach can be quite busy – not by international standards, but noisy enough with young children and chatty tourists. So you’re after more tranquillity or want to make a day-trip out of it, check out the other beach options listed below. At the northern end of Paihia is Te Tii Bay. Te Tii is sheltered and therefore generally calm, and suitable for swimming and fishing. It also has a children’s playground at one end, making it a popular spot for young families. 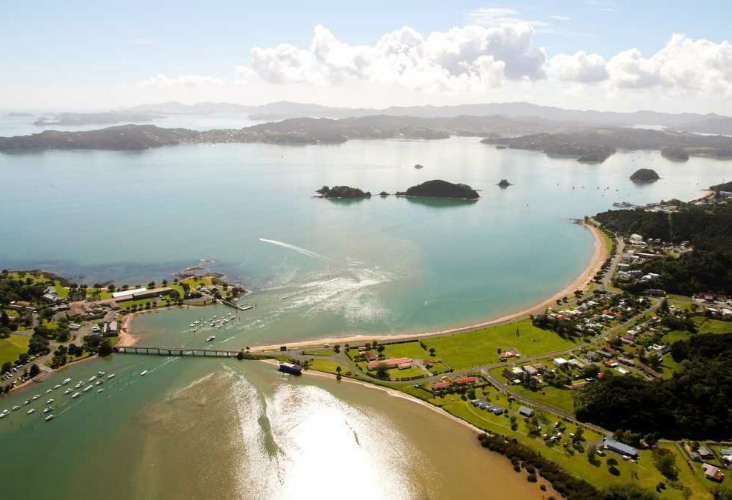 Just head towards Waitangi from Paihia – it’s just around the corner. 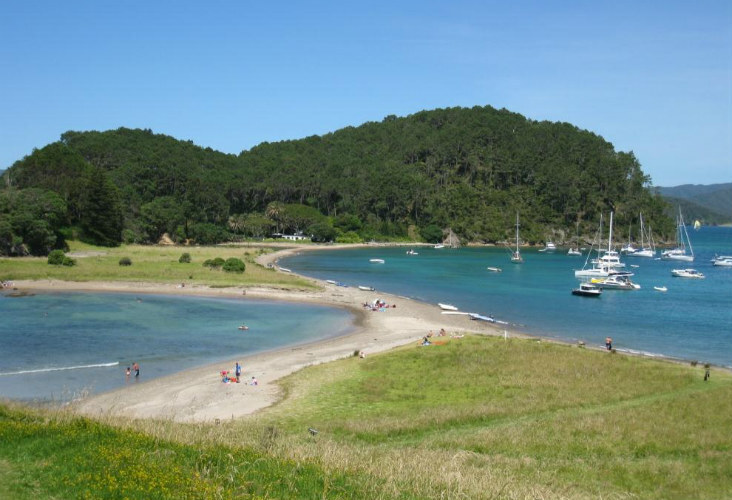 Just outside of Paihia is a lovely secluded bay that’s considered a local secret, as there’s no road access. To get there, just walk around the rocks at low tide from the southern end of Paihia Beach. 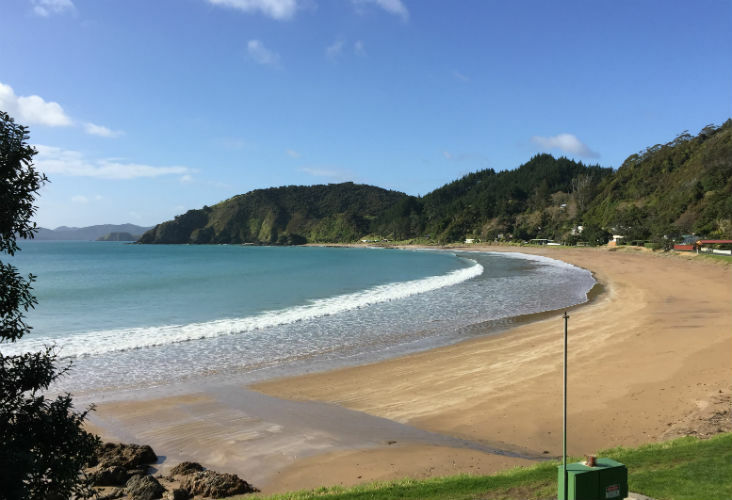 While Russell’s main beach (Kororareka Bay) is a calm spot for a dip, locals usually prefer to pop over the hill to Long Beach. It’s an easy 20-minute walk from Russell’s township and you can enjoy views out to beautiful Roberton Island. To get there you can take a stroll through quaint residential areas (there’s a rich heritage to soak up in the town itself – see our Russell Guide), or take the short drive. Parking is usually easy found near the water. Tapeka Point is about a half hour walk over Flagstaff Hill from Russell township. It’s sheltered and has very little foot traffic. The beach includes a public reserve under the huge Norfolk Pines (planted in 1830’s! ), public toilets, a boat ramp and diving pontoon. Orca whales and dolphins can often be spotted from the shore (find out more about swimming with dolphins). Further out on the east coast and around 30 minutes’ drive from Russell, Elliot Bay is a surf beach popular with campers and those looking to hide away. It’s a little more rugged and exposed than the calmer Russell beaches listed above, but still has beautiful white sand. There’s not much in the way of local amenities so pack a picnic under the surf wax. And if you’re up for some local surf lessons – check out surf tours here. If you’re happy to walk a little, you’ll be rewarded with this seaside stunner. Oke Bay is situated in an isolated part of the Cape, the perfect setting for a romantic sunset stroll and is a must visit for people who are fine with going off the beaten track a little. The walking track to the beach is off Rawhiti Road (the starting point of the Cape Brett walking track) about 29 km from Russell township. If you consider yourself a walker and ‘nature observer’ like us, you might like to consider guided walking / hiking tours in the Bay too. 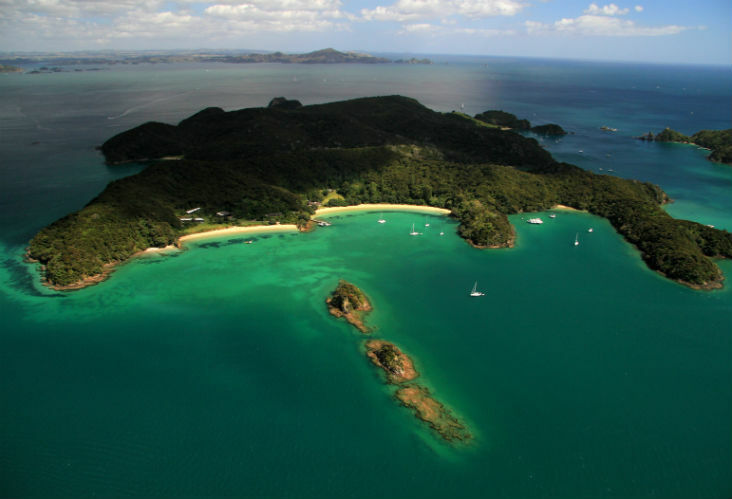 There are over 144 islands in the Bay of Islands. The stunning beaches that stud these coastlines are only accessible by boat or helicopter – some via kayak or water taxi from Paihia. If you’re kayaking to an island from the ‘mainland’ please make sure you are experienced and that you double-check distances and conditions. The weather can change dramatically when out on the open sea. Your best option may be via a local guided kayaking tour. Check out our guide for kayakers, or some options for kayak hire. Like all NZ beaches – leave only your footprints, taking all rubbish with you if bins are not provided. If you have a dog in tow, please do a quick Google search about whether the Island/beach you choose is a nature reserve (canines are not a good mix with wildlife and are strictly prohibited in many areas). And unfortunately, you can’t set up camp anywhere you please either. Instead, there are designated sites – so check this before you make plans to stay over somewhere. A good place to start when planning your adventure is the Department of Conservation ‘DOC’ website. 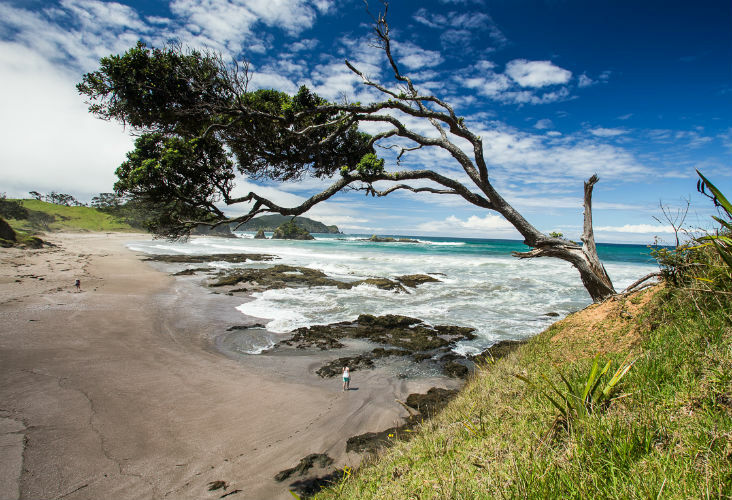 Roberton Island is a tranquil little gem, steeped in Māori and colonial history. Roberton Island was once called Motuarohia Island, before being purchased from Ngāpuhi chiefs in 1839 by a whaling ship captain, John Roberton. But even earlier than this, Captain Cook anchored the Endeavour just off this island in 1769, and it was soon after named Cook’s Cove. According to his records there were 200-300 Maori on the island at this time, and he and his crew were involved in a clash ending in gunfire. It’s popular for its picturesque coastline, and two stunningly beautiful lagoons at Twin Lagoons Bay, which is easy to walk to. For visitors who are game, there’s a wonderful underwater snorkel trail set in the natural lagoon there. The island is completely unspoiled, with no public facilities, so please take all of your rubbish home. There’s a great fifteen-minute walk (uphill though) from the western end of Twin Lagoons Bay to a lookout in the middle of the island. Bring your camera for this one. You can easily moor on any one of this island’s four picturesque beaches. 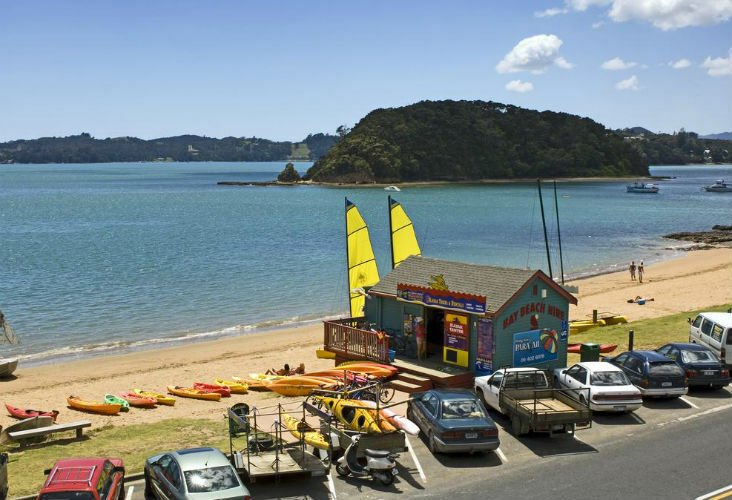 You can also catch a water taxi from Paihia, which is a popular option. 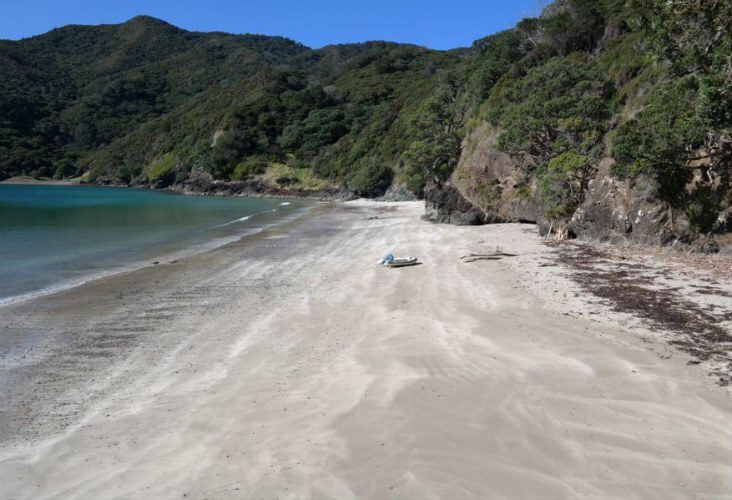 Otupoho (Homestead Bay), Waipao (Frenchman’s Bay), Waiwhapuku (Army Bay) and Mangahawea are the four beaches on this island reserve and each is a little different. If you’re happy to head inland there are heaps of swimming and snorkelling spots on the island too. The Moturua Island Track can be accessed from any one of the beaches, and all up is a 4.5 kilometre loop around the island, offering incredible views. The best anchorage here is on the south side of the island, in the sheltered haven of Stockyard Bay. There are lots of beaches to explore, but many visitors make sure to don their hiking boots and take a walk to take in the views. Waewaetorea Island’s history is enriched with fascinating stories, dating back to the earliest days of pre-European Māori civilisation. 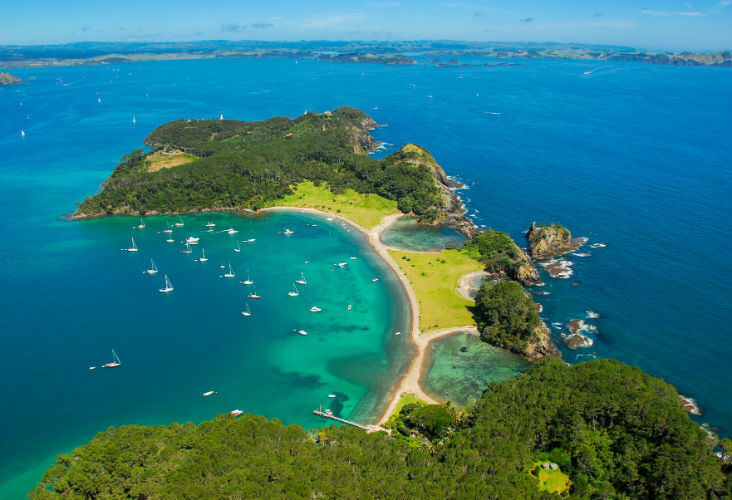 Urupukapuka Island is the largest island in the Bay of Islands, located about 7.3 km from Paihia. Thankfully for most visitors there’s a ferry service that operates from Paihia and Russell at regular intervals. Otehei Bay is the island’s tourist hub and where the ferry unloads passengers. It’s wonderful to just chill out here and soak in the serenity. Or, if you’re happy to explore further, the island of Urupukapuka is abundant with world-class beaches and wildlife. Check out our wildlife guide for more on this. There are countless spots where you can enjoy heaps of water sports and snorkelling, and other fun ocean pursuits. 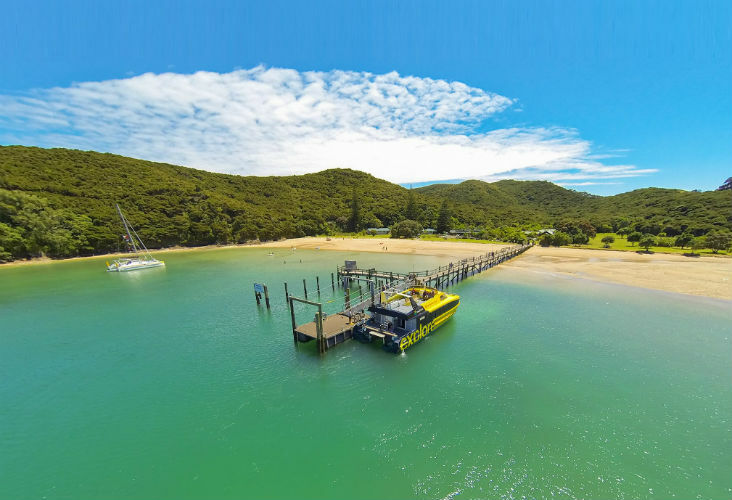 Hire a paddleboard or kayak when you arrive and explore the bays by water, or book a half-day scuba diving experience at Otehei Bay from the booking office in Paihia. There’s even a great café for a caffeine recharge. And there are three campsites to choose from if you want to stay over. Check out the ‘DOC’ managed campsite – you can book online. Project Island Song is an impressive native bird-protection and conservation programme across the Bay of Islands, with the visitor centre located in Otehei Bay, on Urupukapuka Island. If you’re at the beach here it’s well worth popping in. • Sunscreen – Important! The NZ sun is harsh and burn-time can be around ten minutes in the peak of the day in summer. It’s not worth the risk of getting a red face (or worse, melanoma) – so always apply it before you leave, and reapply during the day. • Rubbish bags – many beaches don’t have rubbish bins, if not, take them home with you. • Bug spray in case of the odd sand-fly attack. And always check for unwanted stowaway pests (in bags, bikes and boats etc) before heading out to any island nature reserves. As the saying goes, take nothing but photos and leave nothing but footprints.